Web Desk (January 03, 2019): Four billion miles from the sun floats Ultima Thule, an icy celestial body that NASA scientists announced Wednesday is aptly shaped like a giant snowman. The first detailed images beamed back from the US agency’s New Horizons mission allowed scientists to confidently determine the body was formed when two spheres, or “lobes,” slowly gravitated towards each other until they stuck together — a major scientific discovery. Before that flyby, the only image scientists had was a blurry one showing Ultima Thule’s oblong shape, resembling something like a bowling pin or a peanut. 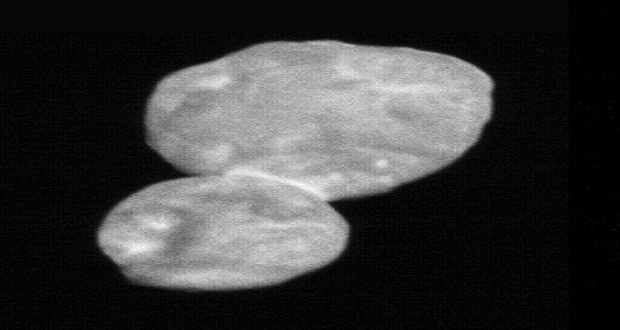 “That image is so 2018… Meet Ultima Thule!” said lead investigator Alan Stern, doing little to hide his joy as he revealed a new sharper image of the cosmic body, taken at a distance as close as 17,000 miles (about 27,000 kilometers) with a resolution of 140 meters per pixel. “That bowling pin is gone — it’s a snowman if anything at all,” Stern said during a NASA briefing.